Whether it is capital inflows that cause stock outperformance, or rising stocks leads to investors chasing upside is one of those perpetual "chicken or egg" type financial questions (although in this day and age of index funds and passive investing lifting all "Marxist" boats on a sea of $18 trillion in excess liquidity without regard for fundamentals, we have a strong feeling what the right answer may be) but whichever way the causal arrow points, one thing is certain: amid turbulent capital markets, panic-inducing spikes in volatility, and emerging markets on the verge of a bear market, tech stocks have seen a relentless investor interest in 2018, or as Eric Peters put it, "tech fund inflows are running at a $37bln annualized pace this year, 2x last year’s stunning rate and 10x higher than any year in the past 15." In light of such an outpouring of capital, it probably should not come as a surprise just how much of an outlier tech performance has been, and yet the following table from Goldman's David Kostin is shocking nonetheless. It shows that in 2018 whose the first half just concluded, just one stock alone is responsible for more than a third of the market's performance: Amazon, whose 45% YTD return has contributed to 36% of the S&P 3% total return this year, including dividends. Amazon aside, the rest of the Top 10 S&P 500 stocks of 2018 are the who's who of the tech world, and collectively their total return amounts to 122% of the S&P total return in the first half of the year. 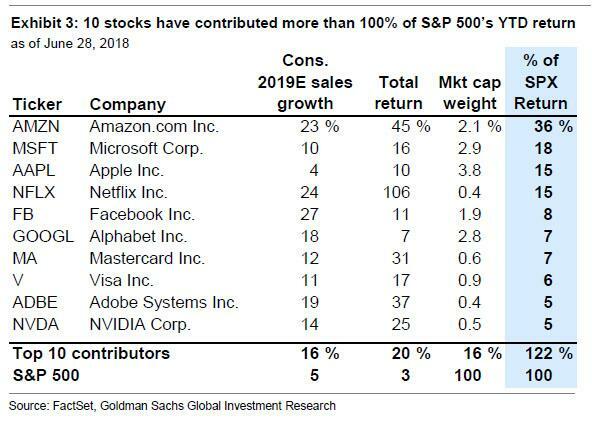 And another striking fact: just the Top 4 stocks, Amazon, Microsoft, Apple and Netflix have been responsible for 84% of the S&P upside in 2018 (and yes, these are more or less the stocks David Einhorn is short in his bubble basket, which explains his -19% YTD return). 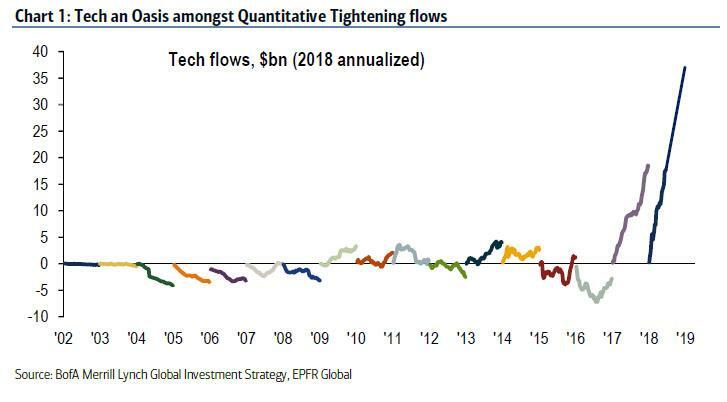 In equities, our team thinks that US tech is vulnerable as a sector where pricing has been insensitive to trade risks so far. For the sake of the market - and Trump's sense of S&P500-defined self-worth - MS better be wrong, because if resilient tech stocks are what has kept US equity market above water so far even as the rest of the world has slumped, then a tech crash may be all that it takes to launch the next recession.